﻿ Portugal 2-3 Ecuador. Friendly but still painful to watch! 06.02.2013 » Portugal 2-3 Ecuador. Friendly but still painful to watch! 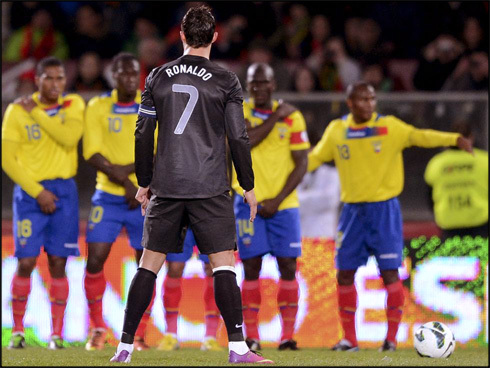 Portugal hosted Ecuador this Wednesday, in a friendly game meant to prepare the next round of matches for Brazil's 2014 World Cup qualification stage. However, things didn't go the way the Portuguese were certainly expecting and they saw the visitors coming on top at the end, with a 2-3 victory. Cristiano Ronaldo celebrated his 28th birthday just the day before (Tuesday), but appearently didn't earn his desired gift from his teammates, as there were plenty of individual mistakes being made throughout the game... However, the Real Madrid forward still seized an opportunity to score a beautiful goal deep in the first half, which equalised the game 1-1 at the time. The Portuguese National Team will now have to improve a lot before the two away games coming up in March against Israel and Azerbaijan, otherwise, the qualification for the 2014 World Cup in Brazil, might very well become an impossible mission. The match started in a promising manner for the Portuguese side. 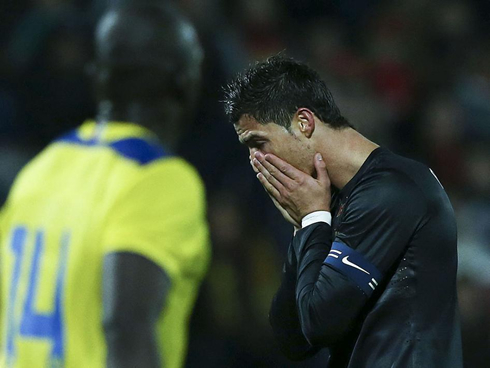 With less than 1 minute ran on the clock, Cristiano Ronaldo and Hélder Postiga got close to score, but neither of them managed to beat Ecuador's goalkeeper. The response came quite fast, as the visitors' first attempt to threaten Eduardo resulted in a goal. Jefferson was given some space on the left, put in a cross for the far post and the Portuguese goalkeeper mistimed his action, allowing for Manchester United's winger, Antonio Valencia, to easily head it into the back of the net, after leaving Real Madrd's left-back Fábio Coentrão, on his back. Portugal had started the game with the wrong foot, but at least the team didn't seem to get much affected by the early goal and still managed to pass the ball around with speed and good criteria. Against the flow of the game, Ecuador managed to dispose of a great chance to extend their lead, but saw Eduardo making a great save and denying Felipe Caicedo just a few meters ahead of the goal line. A few minutes later, the Portuguese reached the equaliser, after a beautiful backheel assist from Fábio Coentrão and a non less beautiful finish from Cristiano Ronaldo. The Real Madrid star brilliantly got away from his marker with a classy touch and then thundered in a strike that had no possibility of being saved. Things were appearently getting back on track, even though the score would remain tied at 1 goal until half-time. Portugal gained the lead for the first time on the night near the 59th minute, after a good attacking initiative from the other Manchester United winger on the pitch, Nani, who sent in a low cross into the heart of the area and which was met by Hélder Postiga, after quickly anticipating an Ecuador's defender. All of a sudden it seemed like Portugal had the game completely in their control, as not only the performance so far had been quite pleasant, but also the result was now more in line with the level of football played on the pitch. However and similarly to what had already happened in the first Ecuador's goal, Paulo Bento's men commited a big mistake less than a minute after their goal celebrations and allowed for the visitors to put things square once again. An harmless long ball pass from an Ecuador's player resulted in a misunderstanding between João Pereira and the goalkeeper Eduardo, with the right-back defender touching the ball back inadvertently and scoring a peculiar own goal. Ecuador's still had much gas left in the tank and they didn't hold it back for too long. With roughly 70 minutes in the game, Benítez chested the ball back near Portugal's penalty box, as he had spotted Felipe Caicedo free of any marking. The former Manchester City forward then blasted a strike into the right top corner of Eduardo's goal, making it 2-3 for Ecuador and putting Portugal into a really bad spot in the game... From that point onwards and with only 20 minutes left to be played, frustration gradually took over the Portuguese players and Ecuador managed to hang on to the lead until the final whistle, with more or less work. 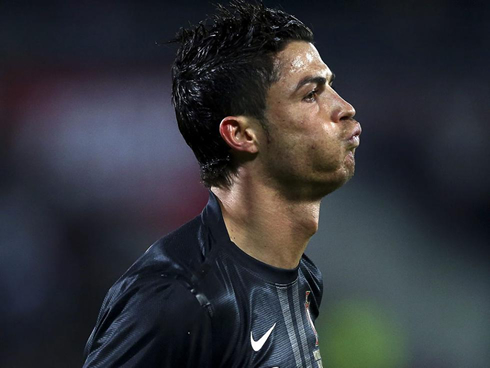 Cristiano Ronaldo next game for Real Madrid will be against Sevilla, for the Spanish League "La Liga", on February 9, 2013. You can watch Juventus live stream, Real Madrid vs Sevilla, Barcelon vs Getafe, Southampton vs Manchester City and Sunderland vs Arsenal, all matches provided from our football live streaming section.